President Trump is defending his administration's response to past hurricanes in Texas and Florida as backlash continues to spread over his comments that the federal response to Hurricane Maria in Puerto Rico was an "unsung success." "We got A Pluses for our recent hurricane work in Texas and Florida," Mr. Trump tweeted Wednesday morning. He said that the response in Puerto Rico was "unappreciated" considering difficult conditions on the small island. Mr. Trump previously gave his administration's response to the storm a "10 out of 10." The governor of Puerto Rico recently revised the death toll as a result of that storm from 64 to 2,975, and many residents were without power for months. Mr. Trump also appeared to place blame for any failings in response to the storm on San Juan Mayor Carmen Yulín Cruz Soto. Soto has long been outspoken about the administration in the wake of the storms, calling the revised death toll "shameful." Meanwhile, in a video message to followers, the president warned those in the path of Hurricane Florence to "get out of its way" and "don't play games" with the storm. "We'll handle it, we're ready, we're able. We got the finest people I think anywhere in the world. FEMA and first responders are out there, they're going to stand through the danger of this storm," the president said a message recorded in the Rose Garden at the White House. 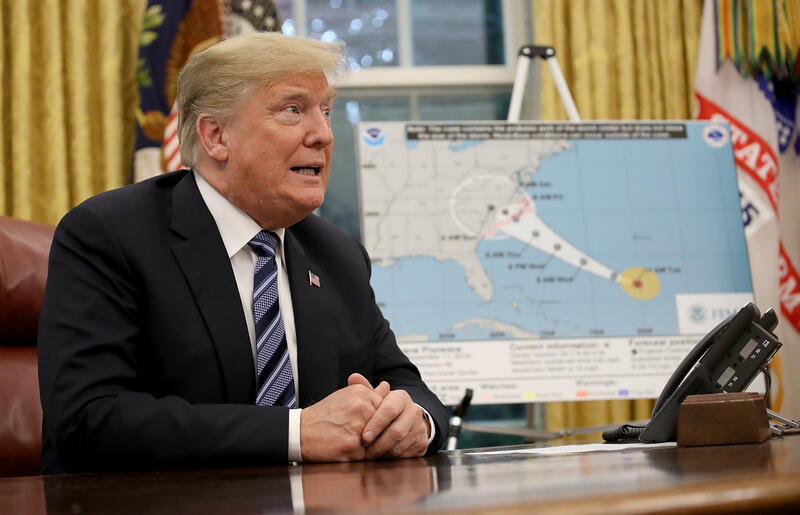 Mr. Trump noted to followers that while the government is "fully prepared" for its next response, "bad things can happen when you're talking about a storm this size. It's called Mother Nature. You never know. But we know." He urged those in the current path to listen to their local representatives, predicting that the storm would be "hitting pretty soon" and would not change its course. In another tweet Wednesday morning, the president said the hurricane "may now be dipping a bit south and hitting a portion of the Great State of Georgia."